Cabin Pressure is a radio show that follows Carolyn Knapp-Shappey, who won a small jet in her divorce and started a charter airline (or air dot, because you cannot put one plane in a line). 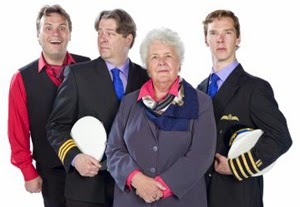 She has two pilots (one voiced by Benedict Cumberbatch) and her not-so-bright son is the flight attendant. Some friends introduced us to the show, and we downloaded the first series before a road trip to Ann Arbor. By the time we arrived, I was in the process of downloading the next three. It's fantastic. Eric and I went to Pieminister, a pie chain in the United Kingdom, frequently when we were in Oxford. Very, very frequently. We went through multiple "buy 10 pies get one free" cards. Pieminister put out a cookbook of pie recipes, some from their regular menu, but many new. Eric and I got it this fall and have loved the pies we've cooked so far. To be fair, we've only tried a few recipes, but they've been so good that we just keep making them. The sausage and cider pie is always a good idea. Published in 1992, friends loaned us this book recently. Set in Oxford (so of course I was going to love it) in 2054, Kivrin is one of the university's historians who study the past by traveling back in time. She is intent on visiting the Middle Ages, which terrifies her mentor, Mr. Dunworthy. She gets sent back to 1320, but while she's away an epidemic breaks out in Oxford and prevents Mr. Dunworthy from confirming her location in time. The story alternates between the two eras and includes transcripts of Kivrin's recorded memos of what she sees. The Doomsday Book was absorbing and struck an emotional note that I didn't expect. Last Christmas, my mom and my sister coordinated their gift giving and gave me a wok (from Mom and Dad) and a cookbook (from Becky.) Written by a food columnist in Seattle, the cookbook offers Asian recipes and Western-style foods and it quickly gave us some of our favorite meals. From chorizo hash to kung pao chicken to beef stew, it's made for a delicious 2014. This Etsy shop has been a great gift resource over the past couple years, and this winter I bought myself some of the best smelling body scrub I've ever found. I had to actively remind myself not to eat it. Happy new year! 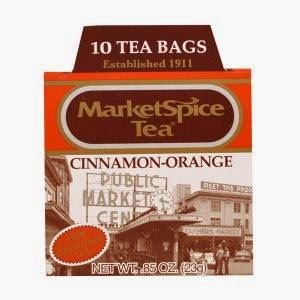 What are some of your favorite things from 2014?